I seem to have a love-hate relationship with my sewing machine - I've neglected it terribly the last five years or so. 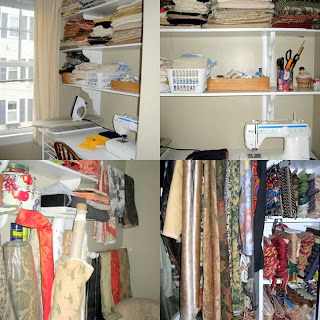 Consequently, my sewing room became a catch-all room. But I've been thinking about getting back to sewing, so the first step was cleaning it up. It took me a whole day, but it was worth it. I sort my fabric by color and type. I use wooden curtain rods on the walls to hang fabric - it's also a great way to design. I keep bolts in a large metal garbage can. The closet has more fabrics on hangers and shelves with trim. Now I just need to jump in and start sewing!